My seventeenth ground of 2015 was on Tuesday 15th September at The Northolme in Gainsborough, Lincolnshire. 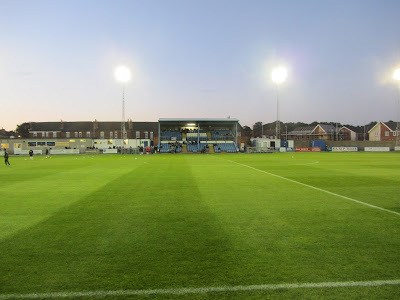 The match was Gainsborough Trinity vs. Tamworth in National League North. The Northolme is in a residential area close to the town centre. The nearest viable railway station is 1.5 miles south at Gainsborough Lea Road (technically Gainsborough Central station is much closer but with only three services per week it is of very limited use). 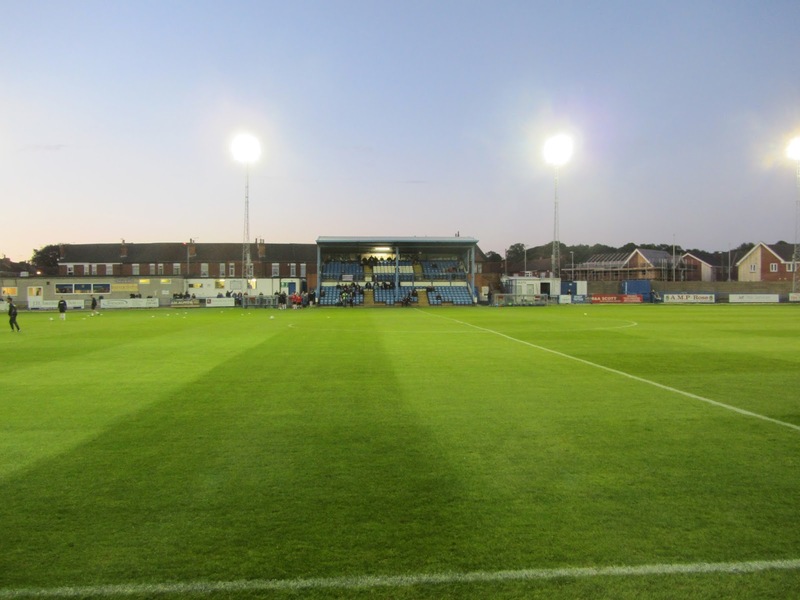 The venue was built in the 1850s as a cricket ground and has been home to the football club since 1884 making it one of the longest serving grounds in English football. The Main Stand is next to the half-way line on the northern side of the ground. This two-tiered stand has just over 500 seats and three supporting beams towards the front of the stand holding up the roof. Either side of this is uncovered standing with the western section containing a couple of demountable buildings. The north-west corner of the ground includes a club shop and kids snack outlet which sits next to the covered concrete terrace which runs behind behind the western goal. The south-west corner of the venue includes another food outlet just inside the turnstiles while directly outside the ground is The Blues Club supporters bar. The southern side of the ground is covered concrete terracing for around two-thirds of the length of the pitch with hard standing directly in front of this. The area behind the eastern goal is uncovered terracing.Though the ground is tightly packed in its surroundings there is a decent amount of space inside with an overall capacity of just under 4,500. The hosts were fortunate to avoid going behind in the 12th minute when Elliott Durrell hit the post with a low drive from just inside the box. However, they weren't as fortunate a minute late as Elliot Durrell again caused problems as he skipped through the Gainsborough defence before unleashing a low curling shot into the net from 20 yards out. In the 34th minute Tamworth doubled the lead when a corner to the back post was struck hard into the bottom corner by Owen Warlow. The visitors were rarely threatened during the game and the event passed by with an largely uneventful 2nd half. The closest the match came to another goal was in the 75th minute when Jan Budtz saved a Ross Dyer shot from close range to prevent a the defeat getting any worse.